What Is the Statute of Limitations for Filing a Personal Injury Claim? If you were hurt in a car crash, or seriously injured in a slip & fall accident, you may be able to seek compensation by filing a personal injury claim. However, it is important to keep in mind that you will have a limited amount of time in which to file your claim and seek damages. 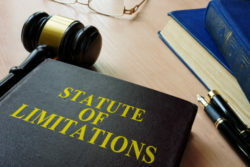 If you fail to file your personal injury claim before the statute of limitations expires, you could lose the ability to sue for damages forever. New Jersey law has a strict statute of limitations that requires injured parties to file a personal injury claim in a timely fashion. In most personal injury cases under NJ law, plaintiffs have just two years to file a claim. This includes personal injury claims, premises liability claims, product liability claims, and medical malpractice claims. It also includes wrongful death claims filed by family members who have lost a loved one due to another person’s negligence. Failure to file before the statute of limitations has expired could permanently bar you from recovery. This means that even if you have a legitimate claim for damages, including compensation for medical bills, rehabilitation costs, property damage, and related expenses, you would be unable to collect. Eyewitness testimony, video evidence, and even admissions of liability from the negligent party could be irrelevant in your case because you will have missed your window of opportunity to seek redress through the NJ civil court system. There are circumstances that can result in an extension of the two-year statute of limitations in New Jersey. For instance, if you first became aware of your injury or illness several years after the negligent conduct (e.g., you were exposed to toxic chemicals while working in a factory and did not get sick until much later), then an experienced personal injury attorney may be able to argue that the statute of limitations did not start until you knew about your injury. Victims of negligence in New Jersey and Pennsylvania deserve compensation. That’s why it is imperative that you speak with a qualified, knowledgeable NJ & PA personal injury lawyer as soon as possible. Contact The Law Offices of Richard A. Stoloff today for a free initial case consultation.